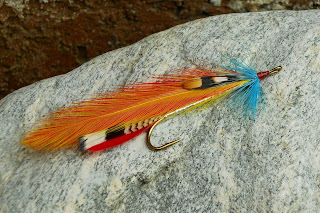 A beautiful streamer, one of a series of streamers named for the Cains River in New Brunswick. This fly was dressed by Phil Foster of Farmington Maine. The Fly and a few of its results. In the Lake Placid region of New Yorks Adirondacks, in the little town of Wilmington sits a fly shop, The Adirondack Sport Shop, the home of the Ausable Bomber. Several years ago on a trip we took of this beautiful area I stopped into this shop. There was a man sitting in a chair behind a fly tying vise. He looked up and said good morning. I introduced myself, and he said I'm Fran. Well we talked for a spell and I learned some valuable information that has helped me become a better fly fisher, and fly tyer. 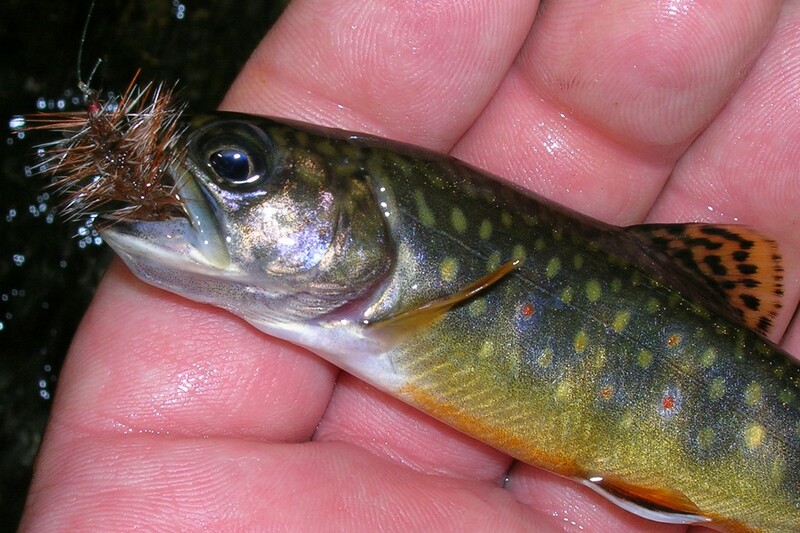 Fran is credited with some of the most productive trout flies to ever touch the water. Patterns such as the Haystack, The Usual, and the Ausable Wulff. But the one fly that is not often mentioned is" The Ausable Bomber", it is in my opinion the best small stream trout fly ever. It is a simple pattern that is not complicated and easy to tie. 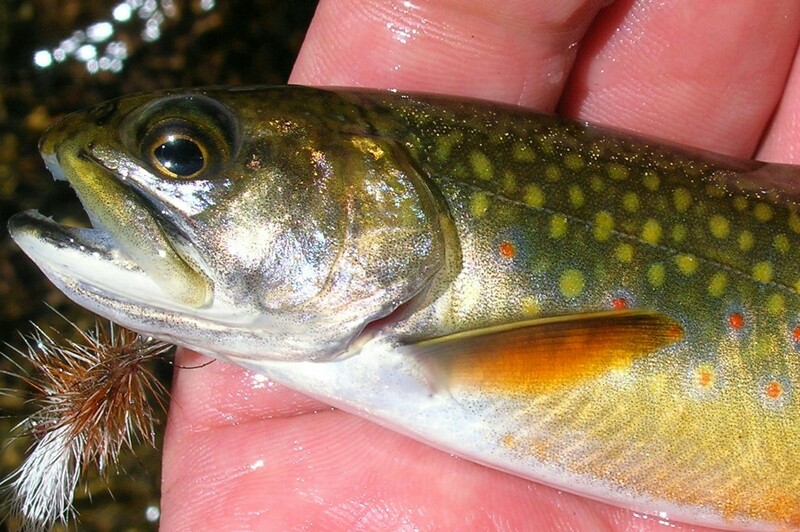 I have fished this fly in many states and have taken trout in every stream I've fished, it will bring trout to the surface in most months of the year. When I started tying this fly I used the Mustad 94840 hook, while this worked, it seemed to be not just right. After a few talks with Fran he suggested I use the Mustad 9671, which is a bit longer than the 94840, this helped me tie the Bomber as Fran did. In my opinion any one who seeks wild trout on small streams should carry this fly and use it as your first fly on the water. I also recomend this book, Fran Betters, Fly Fishing - Fly Tying and Pattern Guide. Wild trout that inhabit small streams have a reputation of not being selective on the flies that are presented to them. Food is in short supply so if it floats by whack it. I have fished many a little waterway in my time and have found this not to be true. Size, shape, and color at times are very important. Color probably the least of importance. 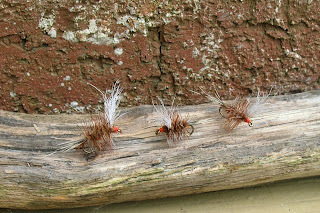 There have been times when a size 14 Elk Hair Caddis will bring a trout to the surface in an instant on certain days, and on others it is refused, the trout prefering a size 16 or 12. I am very fond of fishing a Bomber pattern and it has done very well for me, and on other days a complete dud. I'll tie on a 14 Royal Coachman and drift it through the same run and its met with a violent strike. I have taken various materials used on other patterns such as, woodchuck, calftail, peacock, vaarious colored threads, and dubbings and incorporated them into a series of flies. I have fished these dry, wet, and as a emerger with good results. A pattern created by Randall Kaufmann to represent Stoneflies. This pattern is used widely in western streams. I carry several colors and sizes in my fly box. How many of you carry them and use them? While fishing one of Connecticut's Class 1 WTMA's I had the good fortune of hooking a wild Tiger trout. I had been fishing a dry fly in a run along a half sunken log when a trout rose to the fly, missing it. I continued to float the fly in the same way and a few drifts later the trout took the fly. I could tell the fish was of good size by the feel of its weight. As the fish was coming close to hand it appeared to be a brown. As I reached to the fish I noticed it was indeed a Tiger. He had a lenght of about 12 inches. As I laid my rod on the bank I reached for my camera, thats when the trout made a run upstream and departed. This is only the second Tiger I have caught , the other was on another WTMA also. As I sat back on the bank I wondered how many more of these Tigers swim in this stream. He walks to the little rocky stream, something he has done for as many times as there are flies in his fly box. It's a stream that flows clear and cool through the oak, maple and hemlock forest, its origin in the hills of northeast Connecticut. As he stops to tie on the little Wulff dry fly to the tippet he notices movement in a tree. His eyes make contact with a regal looking Blue Jay. Soon the Jay's loud scolding begins and is relentless for a few moments. Soon the Jay feels that the woods are aware of the fly fishers presence and departs to another tree. As the fly fisher prepares to release the little fly, he looks into the water and thinks, what a tough way of life for those who inhabit the little stream. Everything floating in or on it maybe food, or perhaps death. As the fly starts its drift along the riffled water it moves to the far bank towards a fallen tree branch, a sudden swell is seen on the surface, the sign of a trout trying to take the little fly. As the fly fisher pulls on the line he realizes the attempt has failed. He then sends the fly out a second time and as the fly nears the branch a flash of orange appears from the ten inch depths of the stream and a wild brook trout takes hold of the little fly. After a brief but spirited fight the six inch jewel is held in his hand. For a few moments he admires its beauty, wild icy colors, and heavenly halos that cannot be reproduced by any artist. The fly fisher places his hand in the water and the wild one darts away into the stream. Newmans Own and a sausage biscuit and off I went. The stream was beautiful with a strong flow and water temps of 56 degrees. I cast the fly into the run and did this many times without a take. Moving to the next run I cast the fly along a boulder and as the fly copleated its swing the trout hit. After a brief tussel the wild brown came to hand. The little Picket Pin worked hard for a few hours fooling several more trout but none to hand. There is so much more beauty showing up along the streams now. This is a new venture for me. I have been fly fishing for oh so many years with a passion for small streams that hold and sustain wild trout. In the times to come I'll talk of my times on these waterways as well as other topics. Please feel free to express your thoughts and times fly fishing .